What a mouthful that heading is. 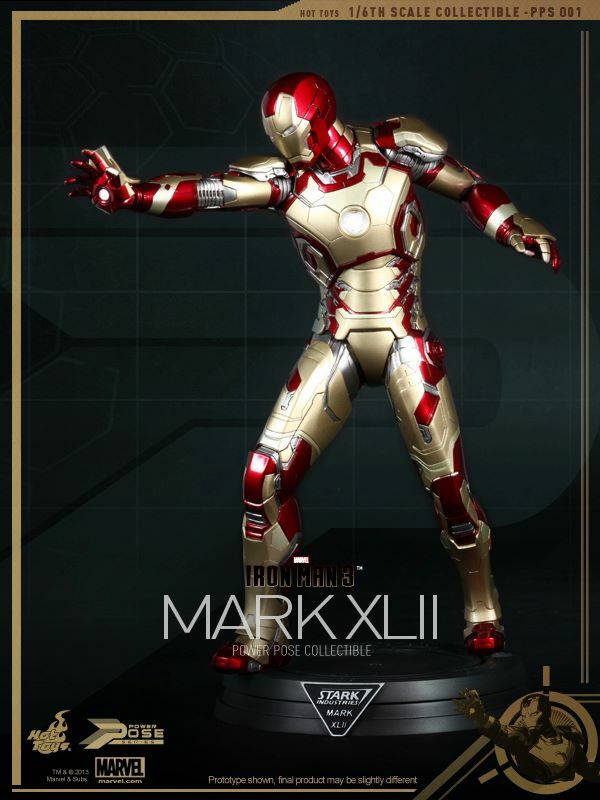 Our dear friends at Hot Toys are having so much success with their Iron Man figures that they've branched out even further for their Iron Man 3 collection with a new line entitled "power pose". For plenty more pictures and some friendly conversation... join me after the jump! It's pretty amazing when you think of how far Iron Man has come. 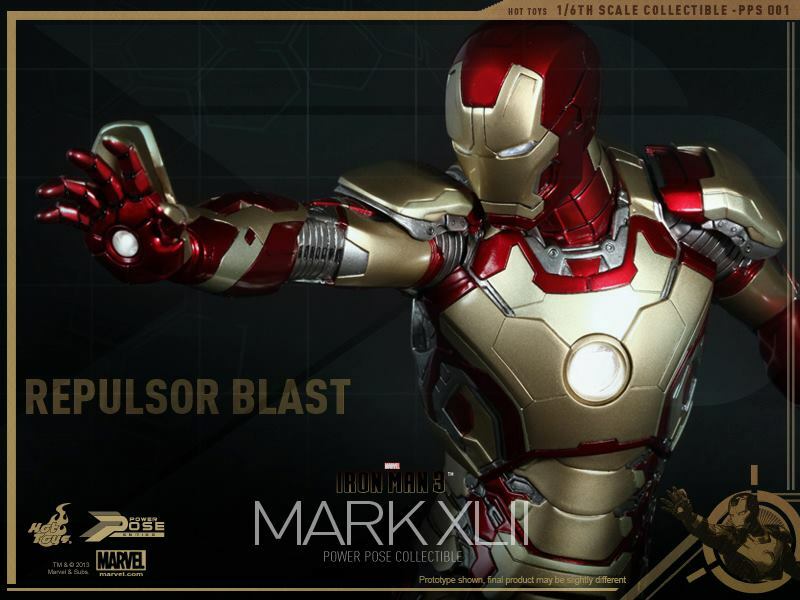 I remember when rumours of a movie first materialised - then rumoured to star Tom Cruise - and my first initial thoughts were 1) Who the hell is Iron Man? and 2) They will NEVER be able to get Tom Cruise to play such a C-List character. Now look where we are and what it did for Robert Downey Jnr. 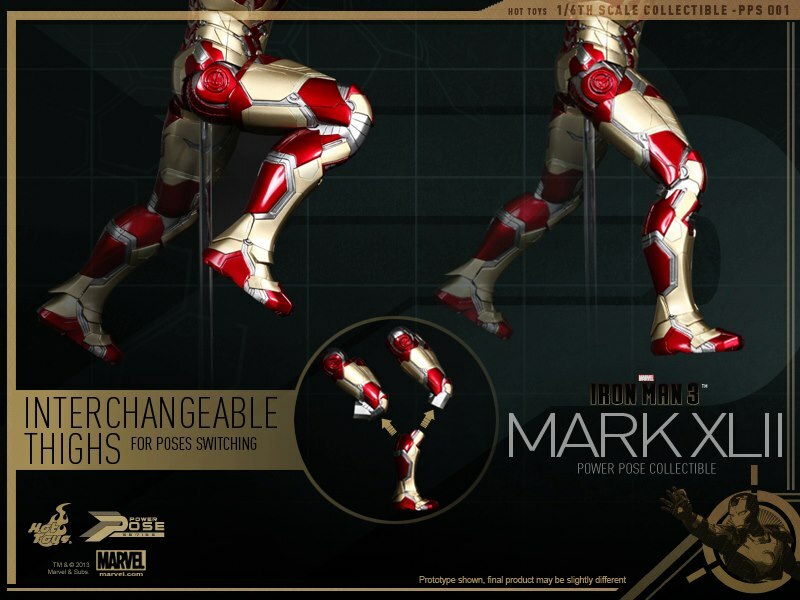 Iron Man is deeply ingrained in popular culture and there's an avalanche of merchandise to prove it. This shows you how the interchangeable pieces work. I guess he can be flying or standing. This is very much more like a statue than a regular figure. 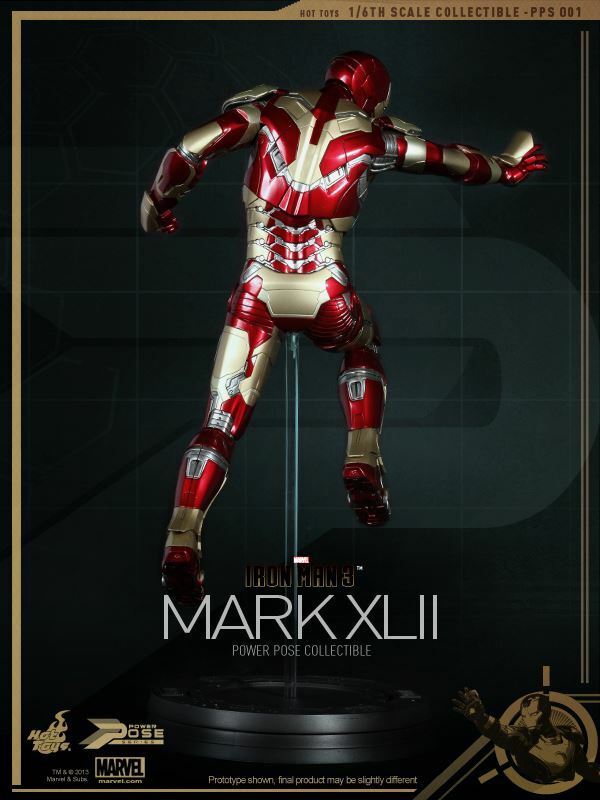 I'll be interested to know the prices on these as the Iron Man 3 busts are quite well priced. I would think that the Power Pose would be cheaper than a regular figure but time will tell. I'll update with Sideshow pre-order info when we have it. And that pretty much shows you the extent of what the figure can do. While my instinct is to prefer the standard articulated figure, most of the ones I own are not especially dynamic on the shelf. Costumes and armour often restrict movement and seeing as how I display them behind glass anyway (and, contrary to what you might think, seldom "play" with them) I guess it makes sense to release a piece that is pre-posed in an iconic manner. 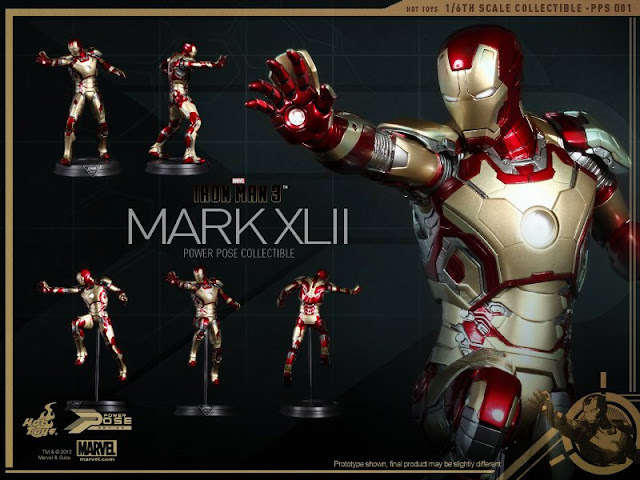 I like the idea of Hot Toys "statues" a lot. I'm more of a statue collector and have never really gotten into Hot Toys but there is no doubt they are top quality. Being able to get statues and busts from them really excites me. Hopefully they continue this trend with other brands in the future. Yeah it does make sense. They have an amazing attention to detail and capture likenesses very well, and I think that statues takes away any stigma that's perhaps associated with the "dolls". There are certainly other characters I'd like to see interpreted this way too. And as such I just can't get behind it. ARRRRRGH! THAT'S ALL I CAN SEE NOW! What are you guys talking about? 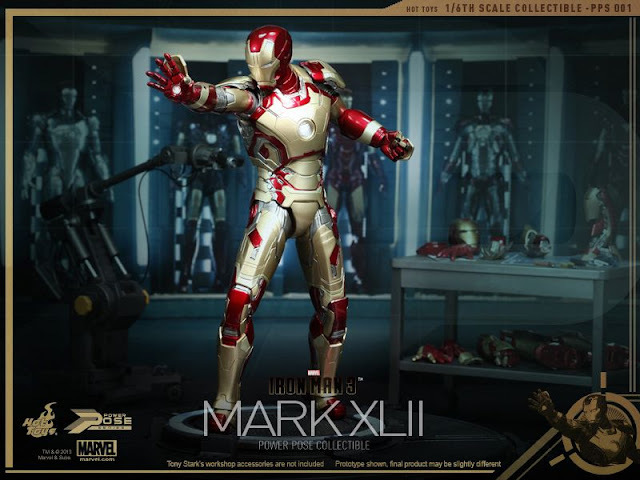 Diet Coke Mark XLII is awesome.